DIDGA DROPS IN… Skateboard Parks! GO DIDGA GO! 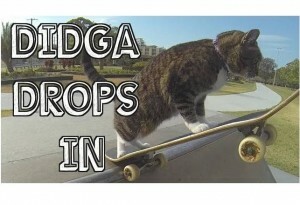 Didga the amazing Skateboarding Cat visits local skate parks to show off her skills! 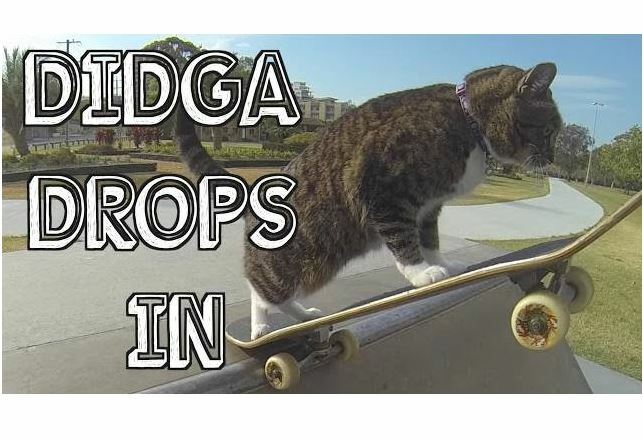 Didga’s petdad and proffessional dog (and cat) trainer Robert Dollwet introduces Didga the Skateboarding Cat’s new video, saying: “Didga now takes her skateboarding skills to the skateboard parks, yes!, she “drops In” First time ever attempted by a CAT (I’m pretty sure). Didja is dog and cat trainer Robert Dollwet’s 2 and a half year old rescue cat. Robert adopted Didja from a shelter at 13 weeks, and his videos with Didja are intended to showcase her talents and to teach humans about training and responsible cat ownership. Robert recommends that petparents keep their cats indoors, then teach them to walk on a leash and other fun things, giving the indoor cat experiences like that of an outdoor cat BUT without the dangers. You can see more on his cat training and amazing cat videos at his CATMANTOO page at Facebook. For more of Robert’s videos at our site, click HERE.